In a modern enterprise environment, you need ruggedized tablets that can keep up with you and your business needs. Tablets allow you to access necessary information from the office to anywhere on the warehouse floor and to communicate more effectively with your workforce. Along with peripheral equipment including mobile printers, bar code scanning modules and host of accessories, rugged enterprise tablets allow you to do it all. 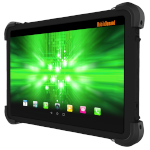 While a warehouse can be a difficult environment for most electronics, rugged enterprise tablets are built to withstand the harshest of conditions. Their ability to survive drops and spills makes them a worry-free tool in a demanding workplace. Mobile tablets are the most efficient way to keep track of your data and increase productivity. The ET50/55 is a flexible business tablet that combines consumer styling and enterprise-class features. 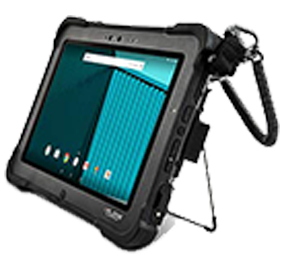 This rugged tablet offers exceptional battery power, durability, and rapid data capture capabilities. 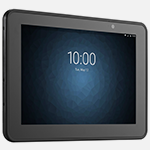 The xTablet T1600 is a high definition i5 rugged tablet designed for the on-the-go professional. This device delivers a touch-first experience, options for outdoor viewability, and inventory tracking. Honeywell’s ScanPal EDA70 is a lightweight but durable enterprise-class 7" tablet computer offering real-time networking and rapid data capturing capabilities. This reliable device provides enterprise levels of quality and security. 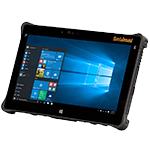 10.1" Windows Tablet – Fully Rugged Tablet PC: The highly versatile XSLATE L10 rugged tablet is ideal for workers who split work time in the office, vehicle, and field. 8th generation Intel® Core™ processors offer ultra-fast performance. 4G LTE card delivers up to 600% faster download and 300% faster upload speeds than previous generations. 10" Windows Hard-Handle Rugged Tablet features a balanced design with an ergonomic hard handle that makes it easy to carry and use when walking and working. The optional barcode reader is built into the handle to expedite data input and verification tasks. The versatile XBOOK L10 2-in-1 rugged computer is the easiest and most cost-effective way to support workers who like the mobility of a well-connected tablet in the field but are most productive when they can use a full-featured keyboard. The Xplore® XSLATE R12 is much more than a next-generation detachable tablet - it’s the fastest rugged tablet on the market today. Gain powerful 2 in 1 capabilities with a magnetically-attached Companion Keyboard that’s always on standby, but never in the way. All ports, all the time connectivity of the XSLATE D10 rugged tablet gives the Android™ 6.0.1, Marsh-mallow OS new edge over its competition. With an IP65 rating and 10.1” sunlight-viewable display, this rugged Android tablet is ready for your job's most extreme elements. The A1150 is sunlight viewable; IP65 sealed, which means the tablet is protected from water, dirt, or dust. It passed MIL-STD 810G for a 5-foot drop. This rugged tablet with Android comes standard with a 10-hour hot swapple battery, 4GB of RAM, 64GB of storage, and Rockchip RK3399 processor. Not sure if a rugged tablet is the solution you’re looking for? Take one for a test drive.